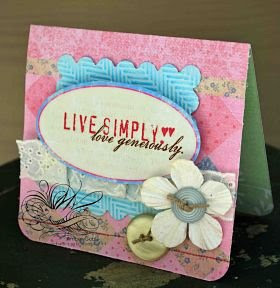 My card this week is a shabby card with a vintage flair. 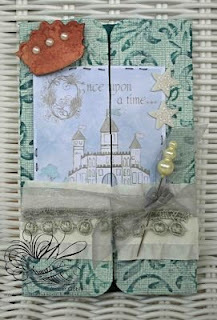 I used "Once Upon a Time" as my card's title because I'm sure all of you and your fiends have a "once upon a time" story! I am in love with Coerdinations Paper! If you are a fan of embossing and distressing your paper, this is the company for you! I used their Whitewash Paper for this card, the front is white and the back is colored....so when you sand or tear your paper, the color comes thru to the white. I used Victorian Folder from Provo Craft. 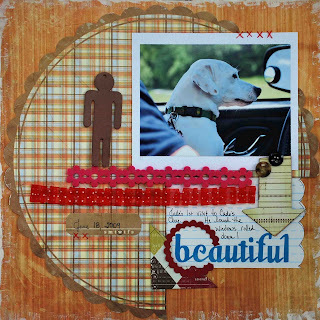 I added a Melissa Frances sticker, Tattered Angels chipboard and glimmer mist, and random pieces of ribbon and pearls. This is a gatefold card, which means it opens in the middle like opening a gate. 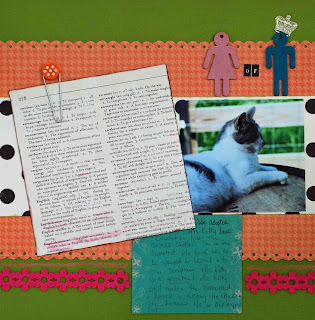 Now it's time to hop on over to Cuttlebug Challenge's blog and check out what awesome projects the DT made this week with their Cuttlebug's! And stop by on Saturday for a fun announcement! I went a little Cosmo Cricket crazy and used a ton of their products. I also used Sassafrass paper. This card didn't have a lot of supplies, nice and simple. Hi everyone! It's the most wonderful time of the week at Cuttlebug Challenge. This week's challenge is to do a project, anything BUT a card + your Cuttlebug. The DT used the new Victoria Folder from Provo Craft. 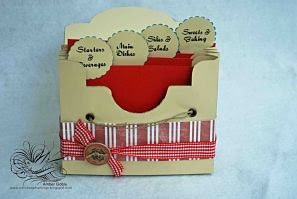 It is such an elegant folder and would be perfect for fancy cards and projects. I used all solid Colorbok cardstock. I ran the white pieces thru my Cuttlebug using the Victoria Folder. 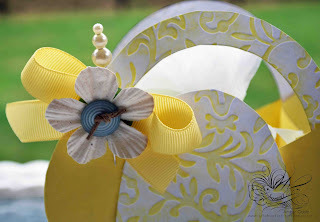 I then ran Martha Stewart yellow ink over the embossed areas. 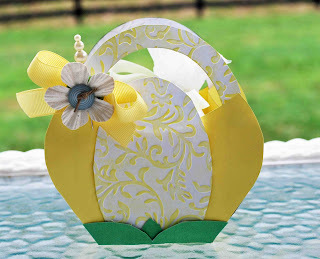 I used a button, ribbon, and flower to complete the little basket. And I wrapped up some chocolate chip cookies for a yummy treat and added them. 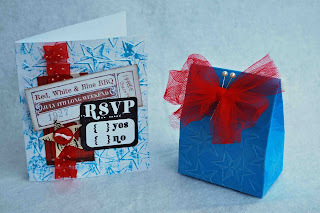 Such an easy project and the embossing adds so much, I didn't even need patterened paper. Go to Cuttlebug Challenge and look at the DT's beautiful projects this week. 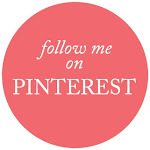 You are sure to be inspired! The Herrigbone is one of my new favorites for the Cuttlebug. It embossed beautifully and was so easy to ink for dimension. The sponsors this week are 2 Red Bananas and Provo Craft. Be sure to check out Cuttlebug Challenge and see the amazing creations by our DT. 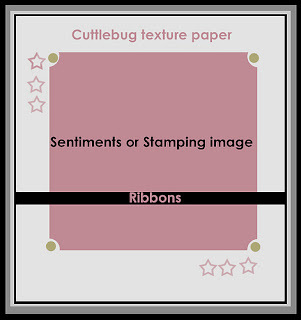 And if you don't have a Cuttlebug, remember you can still play along and create a sketch card. We want everyone to be able to participate! I embossed my owl using my Cuttlebug on lime green cardstock, then onto brown cardstock, then blue. I added my Imaginescense patterned paper to the center of my card. I then cut just the owl itself out of the brown cardstock and did a little coloring to make him pretty. I then took my craft knife and cut the swirls of the folder out of the blue cardstock. I then layered all this onto my card, after spritzing the blue swirls with Tattered Angels glimmer mist. I added 2 small sticks for my owl to set on, adding nature to my card. My card is a bi-fold, so I used buttons and some twine to hold my card together. The tag is My Mind's Eye and I added a Melissa Frances Rub-On. Now visit Cuttlebug Challenge so you can see the color combos for the challenge and the DT's amazing creations. 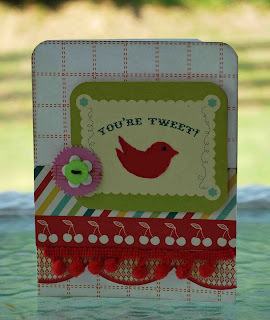 And check out this link to see my creation using the new Cuttlebug Harlequin Folder. 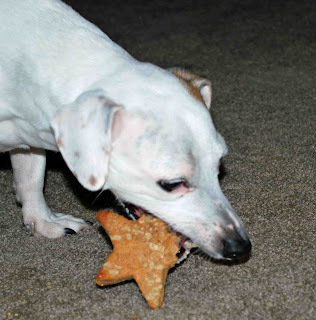 I decided that my doggies needed a special 4th treat also. 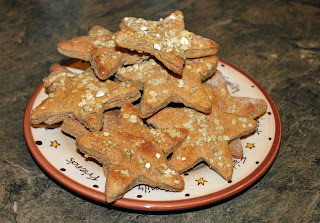 So I made them star shaped peanut butter cookies with oat topping. They loved them. I don't do well going in debt! But he had a very happy birthday so that's all that matters. 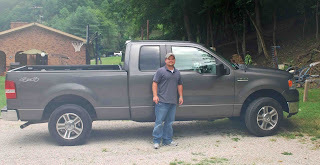 If you look close in this picture, you'll see our doggie Jake setting in the passenger seat. As soon as we got home, hubby dropped me off and picked his best little buddy up for a ride! I've really been making a lot of layouts lately. I go thru spells, sometimes I only do cards and other times I do LO's, and sometimes I do both. I'm happy I have done a lot of LO's and kinda caught up on my scrapping. I'll never be "officially" caught up. I was caught up until 5 years and 7 months ago when I got married. And from the wedding and on, I'm behind. My first LO is of Jake, our little doggie. I used Pink Paisley paper and stickers. I painted the edges of the wood grain paper with Tim Holtz crackle paint. I also used Fancy Pants Chipboard. Here's a LO I did of Mr. Kitty. It tells the story of us finding out Ms. Kitty was a Mr. I used products from my May A Kiss On The Chic Kit. This picture just doesn't look straight to me, but according to my gride at Adobe Photoshop, it is. This Wednesday is special and I've been so excited! We get to unveil the DT creations using the new Stars folder at Cuttlebug Challenge. And we are also unveiling the first of the new DT's creations. The Stars folder is just amazing and I love the detailed stars. This is one of my favorites because there's so many different uses for a Star folder. 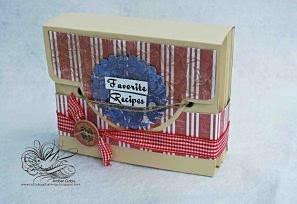 I used a Timeless Template from Papertrey Ink to make my little recipe box. I have some recipes that I only use in the Summer to grill, etc. This little box is going to be a special place to store all of those recipes. I used Melissa Frances paper, Nestabilities, my Cuttlebug and the Star folder, rub-on's from Oriental Trading, and a Jenni Bowlin button. This little project was so fun. I ran copper ink over all my embossing to make it slightly stand out. 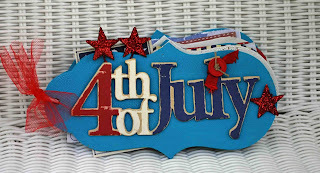 I embossed my card and then lightly painted over it with Tim Holtz Crackle Paint. 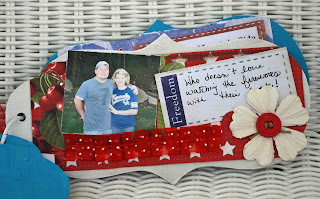 I also used a Melissa Frances tag and Michaels $1 Stamp. Thanks Mom for the little treat boxes! My little box is also embossed using the Stars folder. 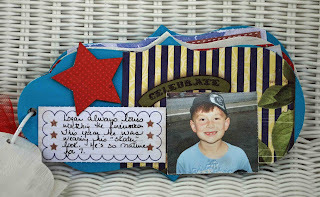 Now it's your turn, using your Cuttlebug use the colors red, white, and blue plus buttons to make this week's project. Use whatever embossing folder you wish. Be sure to check out the DT's amazing creations at Cuttlebug Challenge!